It’s three years now, since the return of Whitesnake with their Top 5 UK album, “Good To Be Bad”. It wasn’t the best Whitesnake album ever, but it was by no means the worst. Yes, there were a few too many nods to the glossy American rock of the late eighties, but there were more than enough throwbacks to the early eighties to keep me happy. This latest album sees them slipping further down the pecking order of record labels, as their association with SPV is no more, this one appearing on Italian indie, Frontiers. They’ve obviously decided to give up on chart action, as it’s one of those infuriating multi-format thingies, which saw it coming out in the UK as a “Fan-Pack”, which seems to involve a magazine, with the CD and a badge, the CD getting two bonus live tracks from 1990. The album then came out properly three weeks later. I say bonus tracks, but they’re actually from the new Live At Donington 1990 DVD and double CD. So I’ll be giving that a miss, and just stick to this vanilla edition. We’re now up to version sixteen of Whitesnake, as the time since “Good To Be Bad” has seen bassist Uriah Duffy, drummer Chris Frazier and, most recently, keyboards man Timothy Drury all heading off to pastures new. So this heralds the recording debut of a new rhythm section in the shape of former Lynch Mob bassist Michael Devin alongside drummer Brian Tichy, ex Foreigner, Pride & Glory, Billy Idol and more. And despite (or perhaps because) of yet more lineup changes, this is actually a better album than its predecessor. 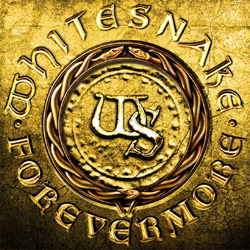 As with the last one, this sees Sir David Coverdale attempting to fuse the various eras of Whitesnake into a new whole, but with less emphasis on the glitter years, and more on what came before and after, it’s a better all round offering. It’s not as heavy as the last album, with more room for some mellow moments, alongside the rabble rousing crowd pleasers. It’s one of those that kicks things off, with ‘Steal Your Heart Away’ swaggering into action with an actual, genuine harmonica riff! Something that will please all the old school fans out there. ‘All Out Of Luck’, ‘Tell Me How’ and the first single ‘Love Will Set You Free’ are all straight out of the top drawer, before the first wild card arrives in the guise of ‘I Need You (Shine A Light)’, a tune that would have sat happily on Sir Davids solo album ‘Into The Light’. ‘Love And Treat Me Right’ would have fitted nicely on ‘Slide It In’, whilst the acoustic number ‘One Of These Days’ is a ringer for “Restless Heart” era Whitesnake. There’s only one out and out dud, and that’s ‘Dogs In The Street’, which sounds like a reject from “Slip Of The Tongue”. Yes, you read me right, it’s that grim. However, ‘Fare Thee Well’ is an utter delight, another acoustic based number, before ‘Whipping Boy Blues’ takes us back to the days of his Jimmy Page collaboration. ‘My Evil Ways’ is another rabble rousing crowd pleaser, before the title track turns into an instant Whitesnake classic. Seven minutes long, it builds slowly as a gentle acoustic ballad, before exploding into a quite marvellous power ballad epic. Lyrically, Sir David hasn’t advanced one inch over the years, as he still slips in enough double (and single) entendres to keep the nineteen seventies in business for a wee while yet. But on the mellower tracks he reminds us what a good lyricist he can be, when he gets his head out of his crotch. The guitar of Reb Beach and Doug Aldrich seem to have finally found a happy medium, and are reined in much more than on “Good To Be Bad”. The production is also warmer, and the whole record hangs together really well. Whitesnake completists, however, are in for a bit of a nightmare. As well as the aforementioned Fan Pack, the Japanese version has a different mix of ‘Whipping Boy Blues’ as a bonus track. There’s a deluxe box edition with alternate mixes of ‘Love Will Set You Free’ and ‘My Evil Ways’, as well as an acoustic version of ‘Forevermore’ and a DVD with the video of ‘Love Will Set You Free’, a making of the ‘Love Will Set You Free’ video and a short making of “Forevermore” documentary. If you’re an iTunes person you get the ‘Love Will Set You Free’ alternative mix and the acoustic version of ‘Forevermore’. Finally, deep breath, Amazon.com digital buyers get the alternate version of ‘My Evil Ways’. That’s a lot of versions, but whichever one you plump for, you can be assured that Sir David Coverdale and his latest version of Whitesnake have come up with a superb mix of Snake old and new. A great CD, good mixture of harder, plus mellow moments. Mr. C once again shows how to put together and blend band members. And as I’m typing this, now Tommy Aldridge is once again the Snakes drummer. Welcome back Mr. Aldridge.